As science and technology advance and are applied to every aspect of our lives, we understand that to keep pace, mainly in the field of work, we must assimilate that education and training never stop, mainly now in the era of the Technologies Learning. Surely you have been surprised to see a colleague, whatever your field of work, apply a method or use a tool that you did not know. The most popular way to keep up is through the e-learning platform, so we dedicated this article to show you a list of the best technology learning platforms and give you some advice on picking a place to study. Let’s get started! Off-line access: it is important that you can download the materials of the online learning courses and see the content later, without access to the internet. 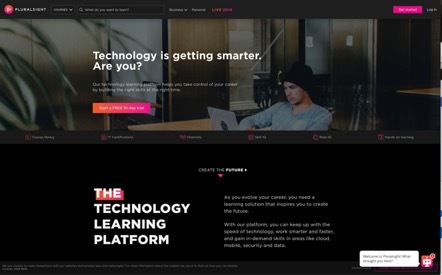 Test period: all good Learning Technologies have a free trial period, usually a few days, which allows you to decide if the site or software is suitable for you. Rated by the majority of its users as excellent, Pluralsight offers its clients a wide variety of courses, more than 5000. Its content is mainly focused on the areas of software development, IT operations, data professional, information and cyber security, manufacturing and design, and business. The people and companies that have used this online learning technology are satisfied with its content, stating that it has had a positive impact on their work thanks to the simplicity of the videos and the teaching methods of the instructors. On the other hand, it is a bit expensive, $ 299 per year, $ 29 per month or $ 1 per day; considering the content is not a bad price, but it still high considering other options. Some client companies are Cerner, Adobe, Nasdaq, GameStop, ADP and Johnson Controls. Free trial for 10 days. More than 5000 courses available. Highly compatible with various devices. Expensive compared to other suppliers. Highly specific content, which can be a bit overwhelming. Some programs require software license keys, which are sometimes not provided in the course. It offers summer courses for a week where your children can discover and develop their digital skills. 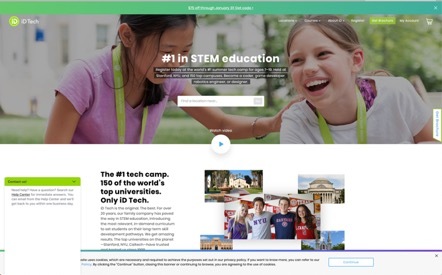 iD Tech has recognized the importance of applying emerging technologies in education, thinking about it, today they offer content focused on coding and web development, robotics, video game development, design, andvideo editing. The camp has a price of $ 1000, young people between 7 and 19 years will have the opportunity to attend renowned universities for that week for the development of their activities, universities such as RIT, MIT, American University, Stanford University, University of Washington, among others. You can also provide your child with online classes and prepare for the camp, this allows you to schedule the class session for the most convenient time, and you can supervise during and after the class. The companywas founded 20 years ago. The courses are for up to 10 students, guaranteeing personalized attention for each student. Your child can enjoy online classes. The teachers are very young, mostly university students. Very expensive to last a week. Many parents complain that their children learned very little. In addition to being an e-learning platform, Udemy can also be qualified as teaching technology, because anyone with experience can become an instructor, therefore, if you think you are trained, you can prepare a video and upload content, if at all. On the other hand, if students like it you will have an additional income. While that is an advantage for people searching for more income, students from all over the world agree that not all the available courses have the best quality. Because of the enormous variety of instructors, however, you will have an easier time finding someone whose content fits your learning skills and style. Many recommend trying a course before buying it and even adding it to the wish list, waiting for promotions. 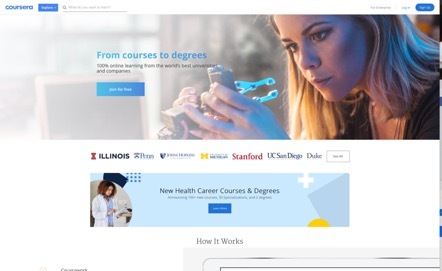 Important companies work hand in hand with Udemy, including Booking.com, VolksWagen, Mercedez-Benz, Adidas, Pinterest, among others. More than 80000 courses available. Each course has a reasonable value, which allows you to choose the specific content that interests you. Each course is qualified by previous students. Your certification is of little value. They allow anyone with experience to teach. You must spend time finding a quality course. 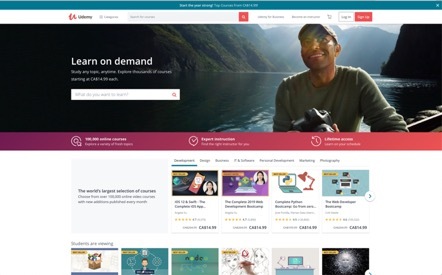 It consists of an e-learning platform where you can access high-quality content, developed mostly by professors from prestigious universities, 181 universities in total allied with Coursera across 27 countries, including The Chinese University of Hong Kong, Imperial College London, The University of Edinburgh, among others. All those who use their services feel satisfied and few are the complaints related to Coursera. Their certificates are recognized by many companies. The quality of the content is excellent. The exercises to solve in the courses are challenging, forcing you to apply what you have learned. The courses are usually demanding and the planning is not very flexible. Access to materials related to the course may be limited. At the moment, they do not have a well-developed support system, if you suffer problems, it will be difficult to solve them. 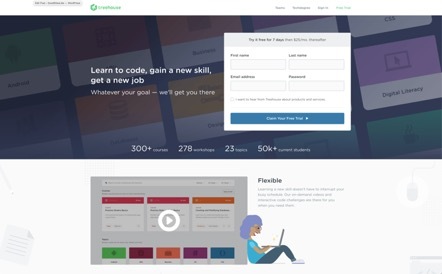 With about 200 available courses, the quality of the content of TreeHouse is undeniable, people who have decided to use this platform are satisfied with the content and knowledge acquired, although they agree that the monthly fee is expensive compared to other sites. The result of their consolidated education system has resulted in their having established alliances with important companies in interesting projects, such as Google Developers, IBM Watson, Amazon Alexa, and Microsoft. In case you are interested in becoming an instructor, you can send a request through their site and contribute your vision. Their aim is to provide digital information for people of all ages, backgrounds and sexual orientations, as they wish to contribute to reducing the education gap and contribute to the development of professionals capable of meeting the demand in positions for digital developers. They keep up with technology. It is perfect for a beginner or intermediate developer. They are focused solely on the area of ​​digital development. It’s expensive, with feesof about $ 199 per month. They do not have free courses. 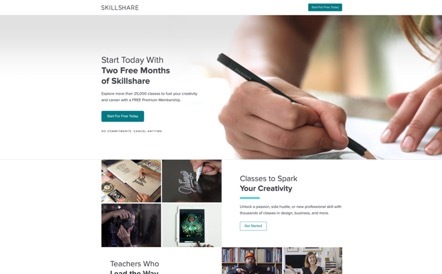 Through Skillshare you can access the content of all kinds in the areas of design, illustration, business, technology, photography and film, entrepreneurship and writing; so you can develop technological skills or try learning crafts. What makes skillshare special is that all instructors apply didactic methods instead of traditional education in classrooms. Its content versatility and adapted to the type of student that seeks concise information instead of formal courses, that is, they are more to strengthen and develop skills than to certify knowledge, in fact, they do not give certificates. This learning platform provides more than 24000 courses, to which you have full access by acquiring your premium package. It currently offers a promotion in its premium package of 3 months of service for $ 0.99. Provides offline learning for users on the move. Free trial of 14 days, and 2 months for new users. They employ an unconventional teaching method. They do not provide any certification. There are no exercises to evaluate the results you had in the course. It is not possible to obtain a personalize deducation, directed by an instructor. We live in an era where technology plays a fundamental role in every market, in fact, thanks to the platforms available online you will discover the possibilities of learning, from your home and in areas that are gaining importance –See how it impacts the education market?-. With dedication and effort,you can develop skills in digital development, web design, business, writing, among others, as well as certify that knowledge if you wish and even choose the class model that best suits your learning skills. Now go and start boosting your skills! And consider the advice we gave you atthe beginning of this post; they can help you find out which is the most appropriate platform for you.